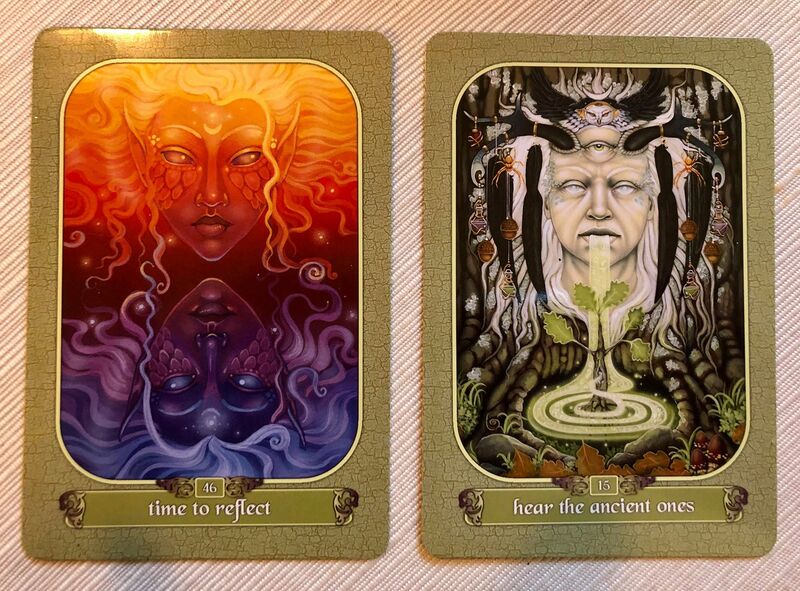 Today’s cards were vying for attention, so I figured it was a day when both were needed. Honestly, they seem to connect in some way anyhow. Hope you all are having a good week. Have you been rushing along, living from one moment to the next without thought or care? Have you failed to notice and acknowledge all that you have achieved and accomplished? Stop. Take a moment to pause and reflect on all that has happened and all that is happening. See how you have grown. See all you have succeeded in accomplishing. Acknowledge and delight in your journey and understand how it has played a part in crating the you who lives in the present. The indigenous people of the world are those who have lived in harmony with the land for countless generations. Among them are the elders whose knowledge and wisdom can teach us of our relationships with nature, of living a life of empathetic awareness, and to better understand our role as caretakers of the earth. They can teach us the wisdom of taking only what we need, of wasting little, and of honoring all sacrifices made so that you may live and grow. Hear the wisdom of the Ancient Ones; learn from their knowledge, lore, and traditions.